This commission is a direct sequel of the two previous commission, part 1 and part 2. After completed preparing these dragon fruits, a Christmas gathering dinner for RU and all RU's adoptable dragons with a special guest at behind the scene. VermillionShine: "Excellent, everyone is here and get ready, Everyone smile for the camera! Say cheese!" 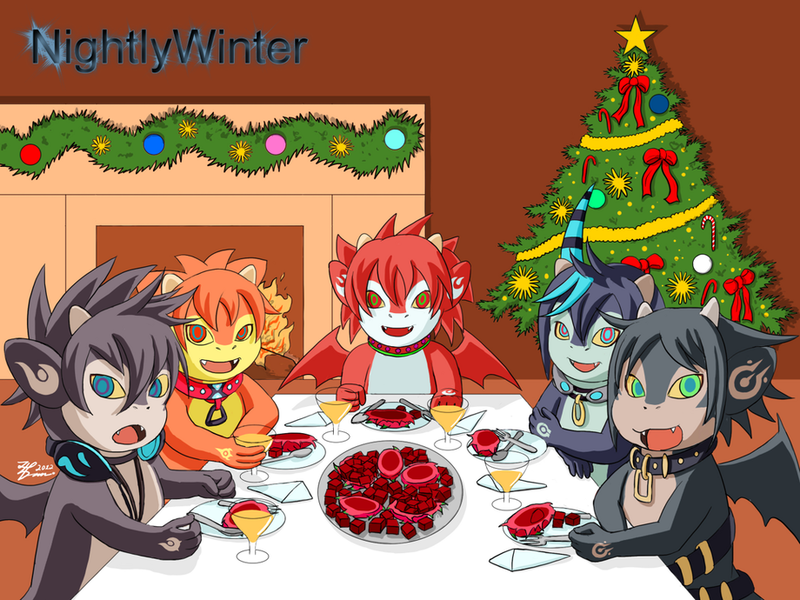 Before the camera flash light emit, everyone except NightlyWinter successfully said: "Cheese!" NightlyWinter: "Nooooo, Vermillion I'm not ready yet and you took my clumsy look, this is embarrassing." VermillionShine: "Sorry, Nightly but I can't keep everyone waiting while you're not getting ready, besides it is a cute expression of you in the photo." \\(llO.Oll)// wowee look at all these dragons!! (llOuOll)// No problem!! i'm looking forward to your dragon artworks! !